Now, I like the Good Queen as much as anyone, but the vampire always was one of my two favorites ever since she was drawn. (The other was the gypsy girl, who didn’t make it into the finals even though she has the cutest embroidery on the hem of ther skirt.) So the Good Queen took an early lead, but the vampire was always close behind, catching up right near the end, and when I got back from Thanksgiving festivities she had won with a respectable lead, 28 votes to 22 (with Undead Marie in third place with 15 and Christine last with 12). 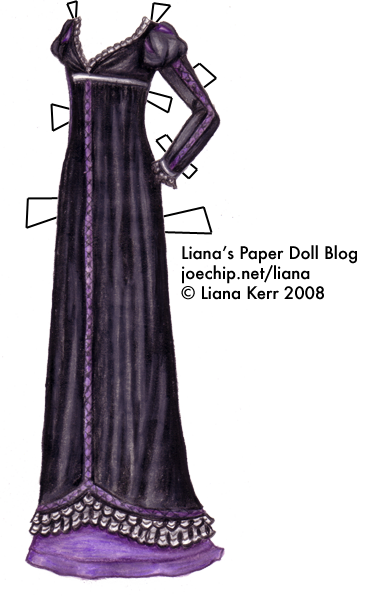 I think the Good Queen must be furious, but as promised, here’s a victory gown for the vampire. I saw her gown as being an undefined Regency style, so here’s a ballgown in the same vein (I’m sorry, I can’t help myself). I don’t think it’s nearly as good as the first one, but it’s not bad. I’m tempted to do extra outfits for all of the finalists, as I’ve become quite fond of them, and now I have a proper pencil sharpener I bet a good ghostly court dress would be fuuuuun, and not the slog that Undead Marie’s gown was. Ooooh! I love it, elegant and just slinky enough for a vampire ^-^! Lovely dress! I’m glad the vampiress won!